The Force Star Wars Accessory Bundle nabi Collector's Edition Tablet Dark Side Version featuring a menacing Vader-like black bumper and striking Stormtrooper frame and exterior sticker wrap. The Force Star Wars Accessory Bundle's digital suite features authentic Star Wars wallpapers and sound effects from the Star Wars movie franchise to customize the on screen experience. Fuhu Brings the Power of The Force to nabi as it Unleashes The Force Star Wars™ Accessory Bundle with the Collector's Edition nabi Tablet. Two Special Edition Themed Packages -- "Light Side" and "Dark Side" - to Feature Wide Array of Digital and Physical Star Wars themed Accessories Including Sound Effects, Wallpapers, Protective Bumper and Exterior Stickers to Customize the nabi Tablet. Bundles Include Collector's Edition nabi 7" Tablet with Sleek New Design. May The Force be with your tablet. Today, Fuhu, the creator of the award-winning nabi® tablet -- the world's first Android tablet built just for kids -- and the foremost innovator in technology for kids and their families, has released The Force Star Wars™ accessory bundle with the Collector's Edition nabi tablet. The Force Star Wars™ accessory bundle enables the next generation of Star Wars fans to showcase their fandom across the ultimate next generation kids' tech product: the nabi tablet. The accessory bundle will feature an array of physical and digital products and experiences for kids to fully customize their nabi tablet in Star Wars style. 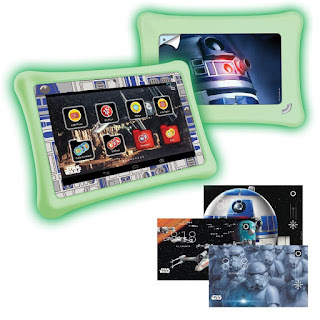 The Force Star Wars Accessory Bundle nabi Collector's Edition Tablet Light Side Version featuring a glow-in-the-dark Drop Safe bumper and R2-D2 frame and sticker wrap. The Force Star Wars Accessory Bundle's digital suite features authentic Star Wars wallpapers and sound effects from the Star Wars movie franchise to customize the on screen experience. Two very special The Force Star Wars accessory bundles will duel it out at retail — a "Light Side" version and a "Dark Side" version – each equipped with authentic sound effects and themed wallpapers to customize kids' on screen experience, as well as tablet stickers and themed bumpers to personalize the exterior of the tablet. The Star Wars Light Side accessory bundle will first be available at Best Buy and will feature a "Jedi-worthy" glow-in-the-dark Drop Safe® bumper as well as an R2-D2 frame and sticker wrap. Meanwhile the Star Wars Dark Side bundle, available widely at retailers including Walmart, Target, Toys "R" Us and nabiShop.com, will include a menacing Vader-like black bumper and striking Stormtrooper frame and exterior sticker wrap to show allegiance to the Dark Side. Both will come packaged with a Collector's Edition nabi 7" tablet, featuring a new sleek design and containing the latest Android OS with Fuhu's groundbreaking Blue Morpho OS overlay -- including more than 400 kid-safe, parent-approved features and digital experiences. Each tablet will be individually stamped with a holographic mark identifying it as one of a finite number of tablets as part of the Star Wars bundle from Fuhu. The Force Star Wars™ accessory bundle with the Collector's Edition nabi tablet will carry a MSRP of $169.99. 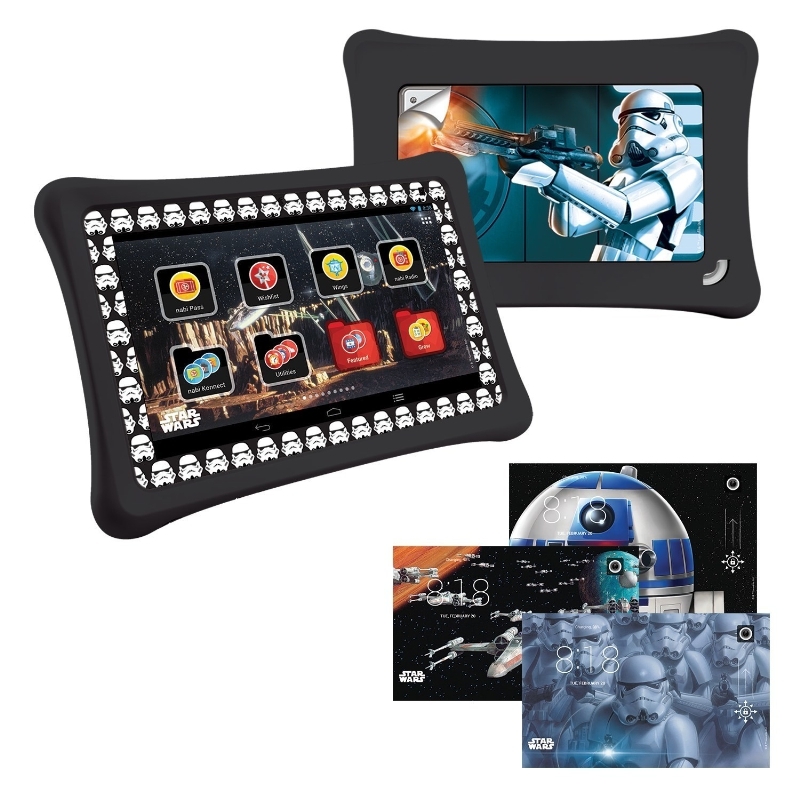 "The special Star Wars accessory bundles and the Collector's Edition nabi tablets have been designed in line with Fuhu's vision of providing enriching experiences for kids that surprise and delight," said Jim Mitchell, CEO of Fuhu. "STAR WARS: The Force Awakens will undoubtedly ignite the next generation of Star Wars fans, and The Force Star Wars bundles will allow kids to express their love of all things Star Wars in a very tangible way, all contained in a tablet that is both kid-friendly and parent-approved." - R2-D2 greets you with his singsong response when you hit the home button. - Need to unlock your screen or check out your apps? Prepare for lightsaber combat! - If blasters are your thing, you'll get an earful when you slide between screens. - Need to activate your alarm functions: get ready for Chewie's signature "Rrrooaarrggh". STAR WARS and related properties are trademarks and/or copyrights, in the United States and other countries, of Lucasfilm Ltd. and/or its affiliates© & TM Lucasfilm Ltd.
Fuhu, Inc., the creator of the nabi brand, is the leading designer, seller and innovator of high-tech consumer products, services and solutions for children and their families. Fuhu is committed to creating family solutions that are: (1) socially responsible, (2) made right, (3) make a difference in people's lives, (4) For Parents. By Parents.® and (5) dedicated to the intellectual development of children. Fuhu, Inc. is the No. 1 Fastest Growing Private Company amongst 5,000 in America as ranked by Inc.'s exclusive 32nd and 33rd Inc. 500|5000 list and No.1 Most Promising Private Company in America as ranked by Forbes Magazine in 2014. Fuhu is a World Economic Forum Global Growth Company and World's No. 4 Most Innovative Company in Consumer Electronics as ranked by Fast Company in 2015. Headquartered in El Segundo, Calif., Fuhu has offices in Denver, San Jose, China, Hong Kong, Taipei and Japan. For more information, visit www.fuhu.com and www.nabi.com. 0 comments on "Fuhu releases The Force Star Wars accessory bundle with the Collector's Edition nabi tablet"